Deodorant. It’s right up there with toothpaste on the list of morning priorities. I’m not above “rinsing” my hair to get out the door on time or even donning a bathing suit when in need of clean underwear. But deodorant is non-negotiable. 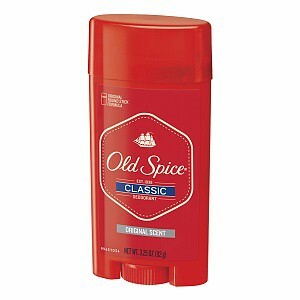 For a long time, I was a dyed-in-the-wool Old Spice girl. The packaging tries to look all gruff and nautical but underneath it all is the “masculine” aroma of…gingerbread and chai. And Christmas. It kind of smells like Christmas. Unfortunately, Old Spice also has Triclosan, D&C Green 5, and a bunch of other sketchy ingredients. So I broke it off with Old Spice and got together with Tom’s of Maine. Tom was a stand-up guy — not flaky like those hippie crystal “rock” dudes. He wasn’t particularly fancy — no smells reminiscent of desserts or holidays — but what he lacked in flair he made up for in reliability. Tom started pushing a new version: Long Lasting. Hops, Zinc…pretty fancy stuff. So I gave it a try. LL Tom is less the reliable nice guy and more the bad boy who makes a lot of promises before “borrowing” your credit card and skipping town with your sister. It seems inconceivable that a deodorant would make you smell worse than nothing at all — but, believe me, it CAN. I assumed it was a unique body chemistry thing, but Mr. Max had the same experience and he barely sweats at all. After 3 work days spent carefully positioning myself at the far end of the conference table, I gave up on new-and-improved Tom. Original Tom is still available, though only from a not-very-convenient health food store a few towns over. I turned to the Internet for information. Like New Coke and Quickster, the aggressive marketing of LL smacks of desperation — and it’s only a matter of time until the bad customer feedback boils over and the company has to backpedal. Right on the Tom’s website were a whole host of reviews of LL Tom. After digging past a few obvious company plants (“OMG it was affordable and worked GREAT!” -a satisfied customer), my experiences were confirmed. I think wet dog doesn’t quite capture the…deathiness of it. And no, the scented/unscented doesn’t seem to make a difference. I have since kicked LL Tom to the curb, but I’m loathe to support a company producing something so vile. 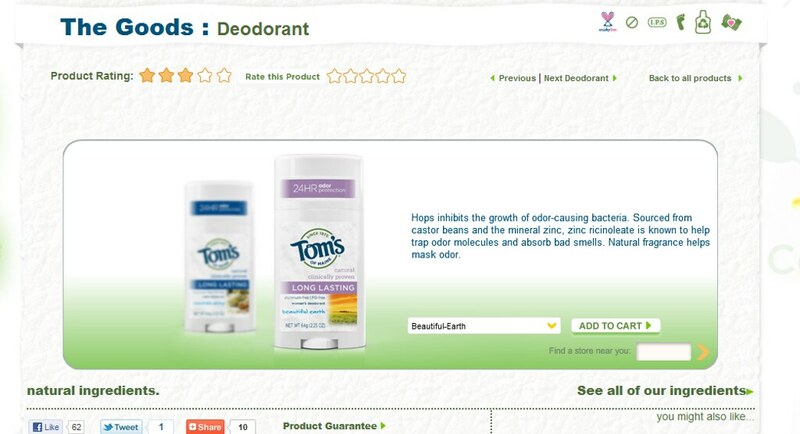 Anybody have any suggestions for a new natural deodorant brand (that’s not one of those crystal rock things)? 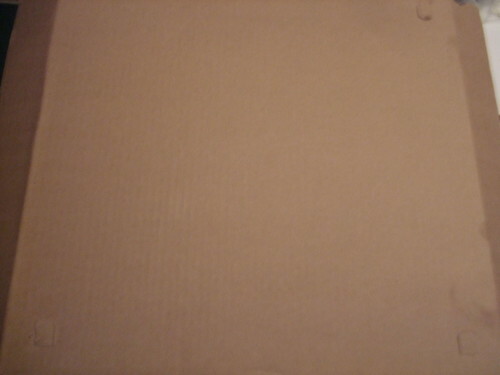 As you may have noticed, I’m something of a traditionalist when it comes to Pizza Box Graphic Design. Mario-esque chefs, black and/or red ink designs, generic product claims — these are at the heart of TAOPBGD. But this week I’m taking a little detour into modernism with not one but TWO non-vintage box designs. 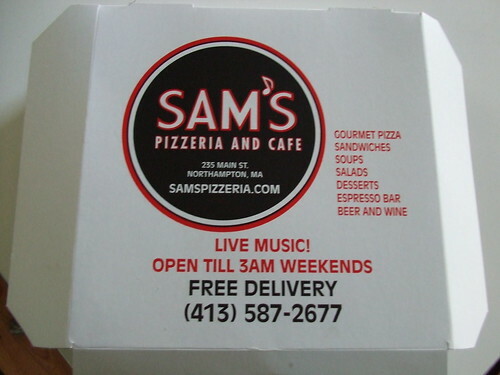 This box came from Sam’s, a “pizza cafe” in the heart of Northampton, MA. Northampton (or NoHo, if you feel like being irritating) is home to both Smith College and a gazillion locally owned coffee shops — ensuring a nearly 100% chance of seeing a tattoo of a nautical symbol or a nose ring on any given day. Sam’s is a bit more uppity than the places we usually seek out for pizza (example: we once went to a pizza joint based on a Yelp review describing it as “dirty but good”). But they do have gourmet slices, are open very late, and serve coffee — all facts that, bucking traditionalism, they print right on the box. Visual Assessment: Red and black ink and “Free Delivery” are the only elements common to the traditional pizza box of yore. No genre scene of Italian stereotypes. No wacky fonts or italics. The word “pizza” doesn’t even appear prominently– instead it’s “pizzeria and cafe.” And a URL. A URL on a pizza box? At least they skipped the QR code. Rating: It’s a modern box, and therefore not my chosen genre. But definite points for spelling, the use of traditional pizza colors (red and black), and the inventive application of an eighth note as an apostrophe. Cute! I have a BFA, which means that I 1) was 17 when I chose my college major and 2) have seen more outstanding displays of BS passed off as art than you could possibly imagine. Once, in a college metalworking class, I witnessed a student successfully deliver a ham sandwich as a completed assignment. The assignment was supposed to utilize modular units to make a sculpture. It was a club sandwich. Art degrees do that to you. 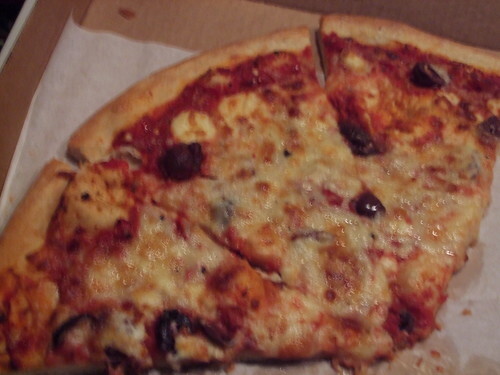 But in this humble design-less cardboard box was perfection: a bubbly cheese pie with feta and kalamata olives. It was organic, and with local ingredients, but still traditional in execution and, despite being from Massachusetts, very very New York. Mr. Max thinks the picture doesn’t do it justice. But I think, even with my dinky camera, it’s clear that this is a bad photo of GOOD pizza. Rating: The pizza’s a definite win, but the box just wasn’t trying, so I’m going all gym teacher and giving it an incomplete. So did everyone else. Mr. Max had to double park as I ran into the neighborhood pizza joint, which had the ambiance of a bar on election night crossed with a depression-era bread line. It was hopping…and desperate. 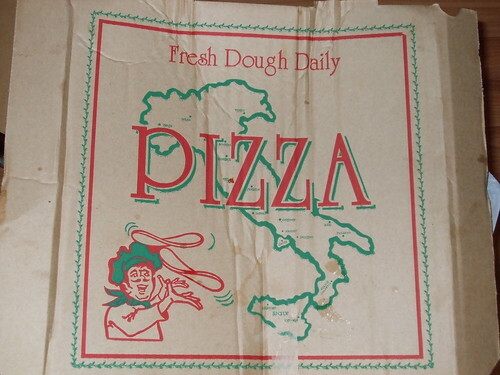 I can’t say I’ve ever seen a map of Italy on a pizza box before, but they graced many a placemat in the pizza joints of my youth. Who among us doesn’t have found memories of learning that Italy is shaped like a boot (adult perspective: kind of a stretch) in a dimly lit 1980s pizza place? So, already major points for classicism. Second favorite thing: A CHOICE cartoon Italian stereotype throwing around the old a-pizza pie. LOVE the mustache. Lastly, a bizarre take on the generic product claim: “Fresh Dough Daily.” Not ingredients in general. Not simply “Fresh Pizza.” Specifically the dough. And why daily? Did I miss a day-old dough scandal that rocked the nation? Does dough get really funky overnight in a fridge? What’s the deal? 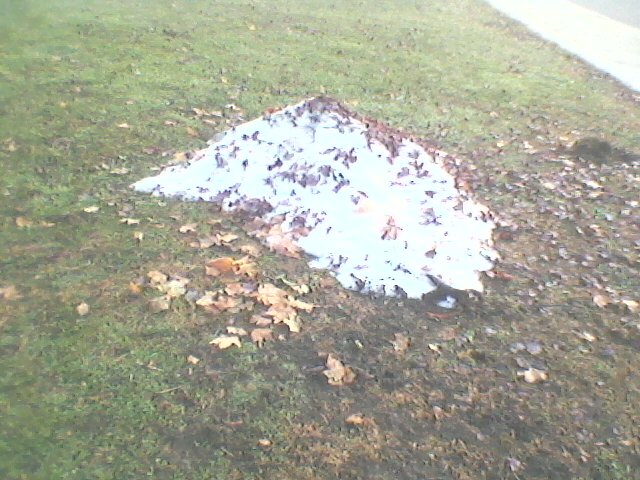 The unholy mix of orange leaves and heavy snow from the recent freak October snowstorm brought plenty of chaos to our neighborhood: downed power lines, trees bent over like soggy french fries, and cars bumper-to-bumper at the gas station. It was the kind of experience makes you go all apocalyptic and start Googling what, exactly, your body needs to survive. Beans and rice and Vitamin C, mostly, in case you were wondering. 1) Cat pukes got cleaned up throughout the day instead of en masse in the evening. 2) Becoming really really accustomed to the sound of wood chippers. 3) Catchin’ up on TV. And by TV, I actually mean Netflix. We’re kind of on the cheap/lazy side when it comes to home technology stuff, so we never bothered to get a splitter to easily go from digital cable to the Wii. Therefore we tend to leave the Wii plugged in all the time and just watch stuff on Netflix, instead of fiddling with the plugs. The funny thing about Netflix is that it tends to have a brainy-ifying effect on one’s entertainment habits. Critically acclaimed dramas, documentaries, and British comedies that feature complex sentence structures – all are comfortably at home in the Netflix queue. Lifetime Movies, Switched at Birth, Dancing with the Stars, and all the other junk I used to watch on TV? Not so much. In my current queue, I’ve got The Diving Bell and the Butterfly, a documentary on the Theremin, and Jeeves and Wooster: The Complete Series. All my queue needs now is a monocle. I guess it makes sense – passively sitting by while TV does its thing is a lot less of a commitment than adding something to a list. Who out there wants to admit that, yes, I’m carving out some future time in my schedule for Keeping up with the Kardashians? Isn’t it better when it just “happens”? But…I love bad tv. Really I do. So I’ve kind of felt its absence under the reign of Netflix. At the end of the week, Mr. Max had to return to the post-Snowtober outside world, but I still had one more day at home. I used the morning for laundry and one of my occasional WiiFit workouts, followed by couch/lunch/TV. Netflix kept recommending Skins, a British series, so I figured I’d give it a shot. Skins follows the exploits of a group of teen scoundrels (and scoundrettes?) in Bristol. It’s an ensemble cast, so there’s a lot of details to keep track of, but the only important thing to know is that EVERY aspect of the show is designed to horrify parents. And by every aspect, I mean that the teenagers in Skins: drink, smoke, peep at neighborhood middle-aged ladies (who peep back), take pills, drive cars over bridges while clumsily reaching for condoms, etc. Oh, and they seem to accidentally see teachers naked a lot. It’s pretty trashy, alright, but it’s like Alice Cooper or a GWAR show – anyone offended by it is probably taking it way too seriously. In short, it’s my new favorite bad TV show. 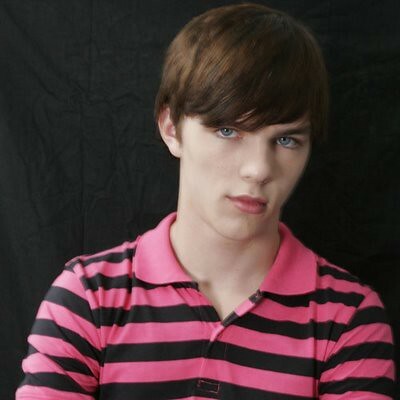 The group of teenagers in Skins is led charismatic but manipulative leader Tony. Tony is basically an a-hole, but everything he does comes off smoother than molasses. In other words, Tony is a Gary Stu. Like Ferris Bueller and Wesley Crusher before him, Tony is a super-idealized wish-fulfillment fantasy for teenage boys. Or TV writers who used to be teenage boys. Tony is usually accompanied by Sid, his best mate and/or greasier shadow. It’s hard not to feel bad for the poor actor playing Sid – in order to emphasize Tony’s coolness, the writers have given Sid a big-time dose of schlubbiness; I’m talking stained sweatshirt, dirty face, a reliance on naked lady magazines…the whole shebang. Did I mention his continued virginity is a major plot point? Naturally, Sid is secretly in love with Tony’s girl Michelle. Michelle’s out of his league, so he settles for hanging around Cassie, a loopy blonde with an eating disorder. Kinda like Luna Lovegood. But with pills. I’ve only seen two episodes, but I look forward to binge-watching a bunch of episodes in the near future. Don’t worry…I’ll throw a documentary in there too.